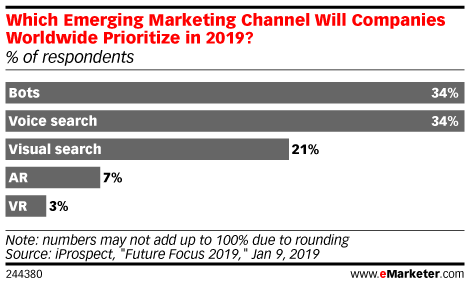 Data is from the January 2019 iProspect report titled "Future Focus 2019." Results are based on the "iProspect Client Survey" where more than 300 CMOs and marketers of Financial Times Stock Exchange (FTSE) 100 and Fortune 500 companies were surveyed online during October 24-November 9, 2018. Respondents are located in Argentina, Australia, Austria, Belgium, Brazil, Canada, Chile, China, Croatia, Denmark, Finland, France, Germany, Greece, India, Ireland, Italy, Japan, Lithuania, MENA, Mexico, Netherlands, Norway, Romania, Singapore, Spain, Sweden, Taiwan, Turkey, UK and US.